The Master of Science in Embedded Systems Design is offered by Advanced Learning and Research Institute (ALaRI), in coordination with the Faculty of Informatics of the University of Lugano and in collaboration with ETH Zurich and Politecnico di Milano. Professors from renowned European and US universities and research centres assure top-quality teaching. Experts from industry contribute with their know-how as tutors or advisors to the research projects. 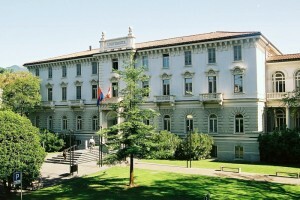 Il Master scientifico in Design di Sistemi Integrati è coordinato da ALaRI (Advanced Learning and Research Institute) presso l´Università di Lugano. Consapevole della reale necessità di un approccio interdisciplinare alla formazione, ALaRI fornisce agli studenti un corpo di conoscenze unico, combinando tecnologie e gestione di progetti complessi, oltre a sviluppare abilità interpersonali come quelle necessarie per il lavoro di squadra e la sensibilità al mercato. Su queste basi ALaRI offre stimolanti opportunità, sottolineando gli elementi di valore aggiunto più rilevanti nei sistemi integrati, e basando le proprie linee di ricerca su problemi di design del mondo reale, come sicurezza e crittografia, pervasive computing, design di sistemi ad alto livello, comunicazioni system-on-chip. Il programma di laurea specialistica spazia su due anni, con quattro semestri di studio organizzati tra corsi obbligatori e a scelta. Un progetto di ricerca è parte integrante del corso di studi e introduce alla tesi finale del Master. I laboratori di design offrono un approccio interdisciplinare, in cui gli studenti apprendono la disciplina del design, applicando in modo integrato le competenze acquisite nei diversi corsi. Inoltre, gli studenti possono personalizzare il loro piano di studi in base ai propri interessi. Design e ricerca: orientato a carriere di ricerca e progettazione, in università o in azienda. Business Projects: orientato alla gestione, commercializzazione e marketing di sistemi integrati. Il programma fornisce 120 crediti ECTS e qualifica i laureati per l´ammissione agli studi di dottorato. Il programma di insegnamento è caratterizzato dalla collaborazione tra università e azienda e dall´approccio interdisciplinare realizzato attraverso i laboratori di design e i progetti. Docenti da prestigiose università e centri di ricerca europei e americani assicurano un´eccellente qualità dell´insegnamento, mentre esperti dal mondo dell´industria contribuiscono con il proprio know-how, fungendo da tutor e consulenti per i progetti di ricerca. Grazie alla sua fitta rete di collaborazioni, ALaRI può aiutare i propri laureati a trovare opportunità di lavoro per impieghi a tempo pieno, stage, o dottorato. Embedded systems pervade all aspects of our daily life, at home, at work and on travel. These “hidden computer systems” control vehicles, buildings and manufacturing plants, are at the heart of cell phones and games, provide critical life support and monitor the physical environment. Embedded system design offers challenging opportunities to designers and system developers, both by integrating such different technologies as microelectronics, cyber-physical systems, computer science and telecommunication, and by focusing on the most advanced applications. Meeting the real need for an interdisciplinary approach to education, the teaching plan equips talented students with a unique body of knowledge in the area of embedded systems. Education includes interpersonal skills indispensable in today’s industry, such as team work, and offers training in the basic marketing and management as well. ALaRI research activities focus on topics of great scientific interest and industrial applicability, based on real-life design issues taking into account system properties such as performance, dependability, security and energy efficiency. Three distinct features also profoundly characterise the ALaRI teaching programme: cooperation between university and industry, interdisciplinary work at design laboratories and projects participation. The formal requirement for admission to the Master’s degrees in Embedded Systems Design is a Bachelor’s degree granted by a recognised university in the field of Computer Science, Computer Engineering, Electrical Engineering, Computer Communication, Information Science or related disciplines. Candidates with a Bachelor’s degree of a recognised University of Applied Sciences may be admitted with 30-60 additional ECTS to be earned during or before the beginning of the programme, with Bachelor courses according to a study program defined by the scientific director. Admissions will be treated on a case by case basis. After graduation the ALaRI students have a number of career opportunities ranging from joining research institutes, industrial practice, starting their own company or joining our research team and continuing towards a doctoral degree. The Master of science in Embedded systems design prepares for a career in research and design of complex embedded systems, creating the ideal scientific competence background for a technical area characterized by continued innovation. Graduates can find a rewarding perspective in industrial environments as well as continue their academic involvement. The curriculum is completed with business courses, allowing their students to accede to professional careers in industry and business. They adds to a solid technical competence in Embedded System Design elements of management and economics. The professional roles it is inferred to are, for example, client project manager, technical consultant, advisor, planning and quality control. The study programme of the Master of Science in Embedded Systems Design requires 120 ECTS and stretches over two years. In the first semester students attend introductory courses and five mandatory foundation courses that run through the whole semester. The second and third semesters are dedicated to specialised courses and electives, where professors from renowned European and US universities are invited to teach during the year. This is one of a kind experience where students are immersed completely for a week or two in a given topic and finish with a rewarding project. The fourth and last semester is dedicated to the writing of a master thesis.